Fiafia night. The one night where all cultures from Samoa and Tonga, right down to Bollywood and Asia get the awesome chance to perform their very own cultural and unique dances. But guess what! At Pt England School we did exactly that. We had an awesome fiafia night, that started off with laughter, smiles, hugs, food, and fun. That transitioned into cultural performances, on going cheering and support from the audience. And finally more hugs and kisses and farewells as it was the last day/night of the Term. For the past few weeks our individual groups had to practise our items at least twice a week. And just knowing that tonight all of that hard work would be unleashed on stage in front of all of our (aiga) family and beloved ones, was just amazing. The night started off with an awesome note. All us girls Ata, Shoal, Brooklyn, Ash and I walked around to each stall that were set out in the courtyard. Everywhere I looked I saw food. And it was such perfect timing, as I was on a diet at the time. But that diet went away just as soon as I saw the sausage sizzle. It was so funny because when I got to the stall I didn't feel as hungry any more. So Shoal, and Ash bought themselves a drink each. We then carried on knowing that soon Mr Burt would ring the bell, buzz the beeper, and then tell all the students that it was time to go and get ready into our performance costumes. Not to mention, all us girls happened to be in the same awesome, amazing group. The Niuean group. The bell then rang and everyone was yelling and running, just as well as the parents. Wishing their children good luck and all. I turned to reality and realised that me and Brooklyn had to be heading off to our first group. Kapa-Haka. We were fortunate enough to be participating in two groups. But it was all about hard work and effort in the time of practises we had in each cultural group. We then headed off to the Library where our group was based. We reached there and had to search for our name tags on a certain piupiu, and dress. I was extremely ecstatic, and couldn't wait to get into it. Then as soon as I did I felt the rush start to kick in. I stared out the window and saw a lot of the other groups already sitting down. I easily recognised the Niuean group with their giant bushy hairs. Everything and everyone looked perfect. Then with in a split second I clicked back to reality. I looked at my group and knew we were going to rock that stage. I then glared out the window once again the seats started to fill, and so did the nervousness in my heart. Everyone had their piupiu's on. The girls with their moko's, and the boys with their energized pukana's. It was time to shine. My heart pounding. My palms sweating. My mind thinking to hard on the negative, when I should be focusing on the positive. Brooklyn and I faced each other and exchanged the most biggest boldest pukana's we could ever give. Our faces showed pride, and so did our heart. As the head of the line I had to move in first. The stairs were approaching me. Or shall I say, I was approaching the stairs. I turned my head to the audience and saw so many shaded heads. I could only hear voices, shouting, all one word description. 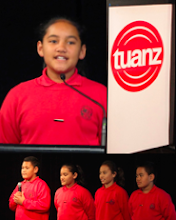 I could hear ongoing cheering as Mr Burt, Vivienne, and Gabriel welcomed on stage the Senior Kapa-Haka group. Makerita I loved reading this post. You are such a talented writer. From your intro right down to the part where you were about to enter the stage was fantastic! Lucky you for being a member of 2 cool groups. I'm so glad that you chose to be part of the Niuean group too. Keep up with the great blogging over the holidays. I can't wait to read the next post.